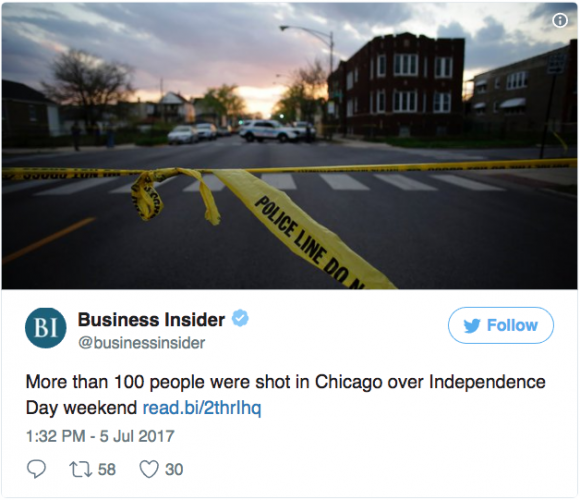 Chicago does not know whether to celebrate or mourn after a long Independence Day weekend ended with 101 people shot, adding up to a total number of around 1,800 for the year. But that number is still below the 2,035 who were shot by the same time last year. Police Supt. Eddie Johnson told reporters how he felt the police force dealt with the weekend’s violence. The city recently celebrated a 14 percent drop in shootings compared to the first half of last year. The city put 1,000 extra officers out, with many working overtime, in hope of controlling the violence on an Independence Day long weekend spanning from Friday afternoon to Wednesday morning. Most of the violence occurred in the last part of the weekend, from Tuesday afternoon to Wednesday morning. 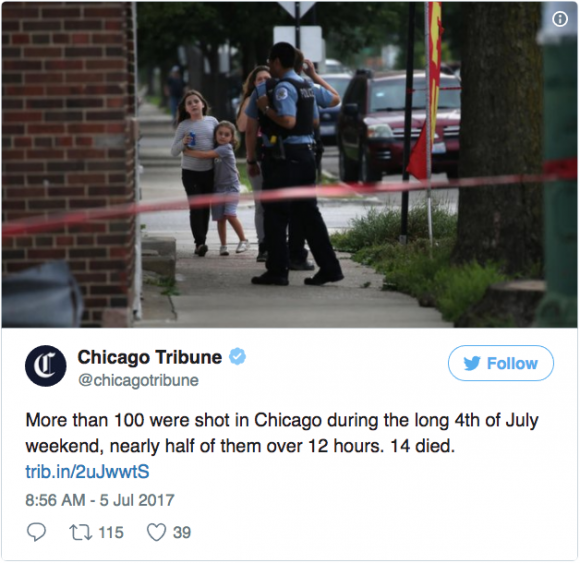 Fifteen people have died so far in the holiday shootings, as Chicago continues to struggle with the problem. A few days earlier, additional agents from the Bureau of Alcohol, Tobacco, Firearms, and Explosives (ATF) came to work with local law enforcement to stem the spread of guns. He also tweeted about Chicago’s gun problem. Four days after inauguration, Trump tweeted about Chicago: “If Chicago doesn’t fix the horrible ‘carnage’ going on … I will send in the Feds.” The current ATF involvement represents the promised federal help. Chicago’s murder rate isn’t too bad if measured on a population basis, but among larger U.S. cities it is the worst. It is the most homicide prone city with a population over a million. A CBS News Crimesider report exposes some of the problems as stemming from sentencing laws that let gun offenders back onto the streets too quickly, and that most of the shootings are caused by people who have been held on gun charges before. 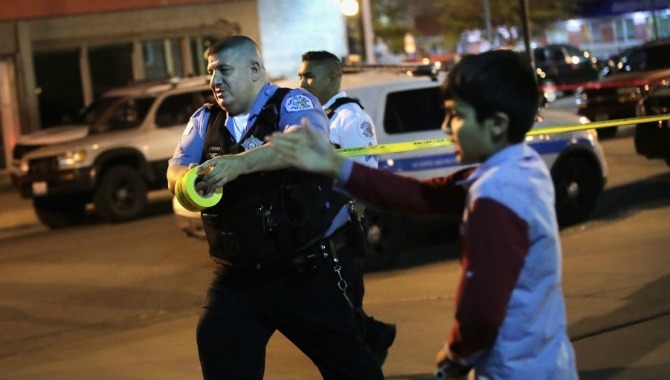 The weekend’s violence took place in Chicago’s West and South sides, where gang and drug violence has led to seemingly incessant shootings.